Just before the Thanksgiving break, CineForm released new betas for the Neo and Prospect product lines (http://tr.im/FNSb.) These have a new feature that we have been planning for ages (years it seems,) the ability for the decoder to render its own passive metadata. The decoder has been applying Active Metadata for many years, developing the image through color parameters and 3D LUTs for creative looks, yet the classic metadata has remained dormant within each compressed frame -- we left it up to vendors using the SDK to extract as needed (and so few do this.) As metadata is so often lost and misplaced, you are lucky if you are left with just the timecode in many workflows, so we long ago moved metadata from side-car files or within the file wrapper (AVI/MOV/MXF) and placed it within the compressed sample itself. This enables the decoder to read its own metadata (not possible with 99% of video types), all that was missing was the font engine to render the results in the display. The decoder now has that font engine. Offline workflows typically have a range of burn-ins top of the video image, returning to burnin free media for online/finishing. 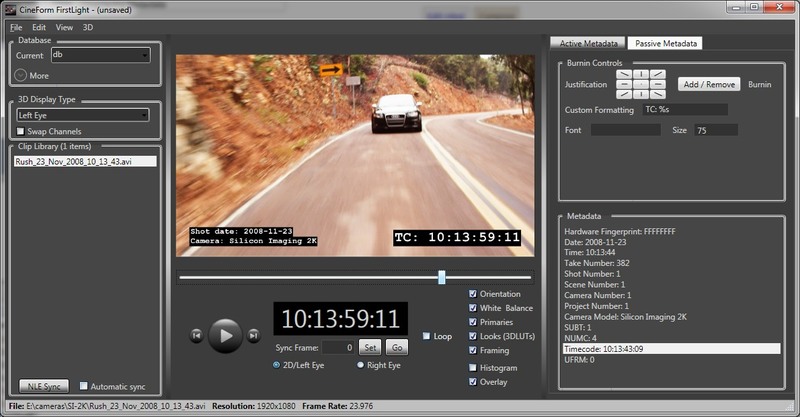 The CineForm burnins are non-destructive allowing the operator to enable the overlay display, choose which elements to display, switch from offline to online with a single click. 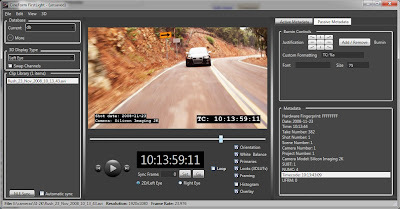 Any tools that uses the CineForm decoder will gain this feature. 2) Import a CineForm clip that has the type of metadata you wish to display. 3) Select the Passive Metadata tab to reveal all the metadata types with. 4) Select an item from the list. 5) optionally -- click the 9-way justification control to determine where you want to place the burn-in. 7) Repeat steps 4-6 to add more metadata to the output. 8) The Overlay checkbox (near histogram control,) globally enables these burn-ins for all clips in the system. If you want custom formatting for your metadata we are using the C language printf formatting. Instead of the recode data "2009-11-26", in the customer formatting add "Date: %s" for a display of "Date: 2009-11-26". You can use this to add freeform burnins like "property of me" by select a random metadata line and not putting a "%s" (string) or "%d" (for decimals) in the formatting. Font name and sizing also are active, setting Arial and size 70 will render the next added burn-in with those characteristics. We aren't stopping at display of new metadata, next we will use this metadata to trigger external applications and tools to act in new and programmable ways -- think of third party apps for your decoder. We want metadata to approach the power of the image data that it is stored with.